As a caring pet parent, you definitely owe your pet a set of tools that would help to keep her well-groomed, clean, and comfortable. Can human hair clippers do it? I’m afraid not. Your hair differs greatly from your little furry friend’s coat. Clippers for both are, therefore, designed differently. I’ve seen some pet parents opt to leave the task to a professional, but if your desire is to save money and cut off those weekly/monthly trips to a professional groomer, getting yourself a set or kit of dog hair clippers would be the best option. Usually hair clippers for dogs are equipped with the power and ability to get through the fur with ease while saving her the pain of dealing with things like lots of noise, high vibration, extra heat, and so on. Because you’ll want to get the best for your dog, I’ll show you things you should look out for in grooming clippers, in addition to more reasons why you need these tools. Then, later on, we’ll look at reviews of the best dog grooming clippers. Power in these devices is usually measured in strokes per minute (SPM). As you would guess, thick coats will need more power and vice versa. However, it’s important to also note that higher power could mean more heat and a higher possibility of the tool breaking down. Grooming clippers are available as a set or kit. 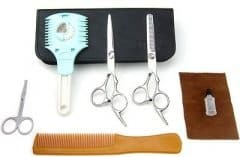 Kits usually comprise the clippers, a charger, maybe a brush, and length attachments, while a set will consist of more tools for grooming, beyond what a kit has; for example, tweezers, nail trimmers and file, grooming scissors, and so on. Because you might be using this tool regularly and for a long period of time (if you have several dogs), it would be best if you opt for one that is ergonomically designed so that you will feel comfortable using it. When it comes to dog hair clippers, the two most common blade types are ceramic and steel. The former takes quite some time to heat up but will remain sharp for a long period of time. For this reason, it’s the most preferred by professional groomers. Steel, on the other hand, works great but because it takes a long time to cool down, that means the waiting period will be longer in between trimmings. Also, it has more vibration and overheating issues compared to ceramic. Some pet parents prefer wired trimmers because you don’t have to worry about the machine switching itself off during a trimming session or having to constantly look at the battery level. Battery-powered clippers, on the other hand, are preferred mostly because of their portability. Different clippers have different noise levels and unlike humans, dogs may not tolerate the noise. So, always look for devices that have minimal noise as this will make the experience better for both you and your dog. Like most machines, clippers are prone to plenty of wear and tear, meaning at some point you will need to replace the parts. To be on the safer side, confirm that the spare parts for the device are easily available. Besides keeping your canine friend well-groomed, clean and comfortable, you may need to have clippers in anticipation of situations such as when your dog has something stuck in her fur and it needs to be clipped out. Depending on the situation, you may have to trim her all over again to even out her coat. Also, if pet grooming is your profession, having great dog hair trimmers is not an option but a necessity. In fact, you’ll want to invest in a kit or set that is reliable, of great quality, and suitable for professional use. Having put into consideration the aspects discussed above, combined with help from established professional groomers and fellow pet parents, here’s what I was able to round up as the best dog hair clippers. 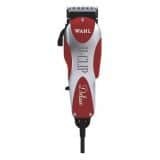 Wahl is a well-respected brand the world over and renowned for both human and dog hair clippers. The Wahl ARCO is particularly special because it’s lightweight (weighing a mere 7.9 ounces). This dog clipper has a detachable blade that can seamlessly adjust to several blade sizes. Because of its small size and lightweight, it’s easy to safely navigate through sensitive areas such as ears, paws, face and sanitary areas during a grooming session. 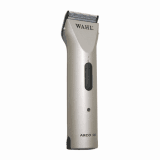 The Wahl ARCO is extremely maneuverable because it is also cordless. The batteries are of high quality with up to 80 minutes of life. You need not worry about charging time because battery recharging is fairly fast (it takes only 75 minutes to be fully recharged). Because this dog clipper contains no motor, a doggy parent can expect no overheating issues. Besides, it requires minimal maintenance. With substantial power and 5500 SPM, it is the ideal dog clipper tool for trimming small to medium sized dogs. If you’d love to own this kit, it’s available at authorized retailers such as Chewy.com. 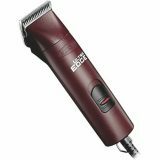 The Andis ProClip Super 2-Speed is ideal for the professional groomer. But even if you are a novice willing to learn how to maximize this tool to benefit your mutt's grooming needs, it would be worth the investment. This is arguably the most versatile dog clipper in terms of blade compatibility. It comes with a chrome-plated blade that prevents corrosion and helps the blade stay sharper for longer. 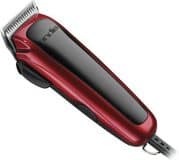 One of the prominent features on the Andis ProClip is the fact that the blade clipper is detachable and the machine is compatible with ultra-edge, ceramic-edge, and show-edge blades. It is also compatible with Oster A-5 blades. Note that all these blades can be bought separately. With such an extensive range and ability to use different type of blades, you are provided with great flexibility as to the kind of grooming care you can bring to your canine pal. Equipped with adequate power, the blade is able to deal with thicker coats effortlessly. This includes coats such as those of poodles and spaniels. In addition to having a shatterproof casing, the machine produces little noise during operation. Thus, most mutts do not object to it being used on them because of the low hum. You can get one for your little friend by placing your order on Chewy.com. With this set of dog hair trimmers, you are likely to enjoy grooming your pooch because they make the process so easy. Included in the package is a set of 7 attachable, color-coded combs that allow you to safely trim and clip your dog's fur to the right size even if you have little to no experience at all. The beauty of the Wahl Deluxe dog clipper is it has substantial power. Not only is it easy to use at 7200 SPM, but the fact that it comes with a 'how to' DVD is quite helpful in case you need some tutorials as a beginner. Its adjustable blade is made from high-grade stainless steel and is suitable for trimming spaniels, bulldogs, terriers, Shih Tzus, Labradors as well as any other short-haired, smooth-coated mutt. It is worth noting that this product is not suitable nor recommended for thick coated dogs with wavy or curly fur such as poodles and Irish wolfhounds just to name a few. If you’d like to get one, visit well-known pet outlets such as Chewy.com. For doggy parents who own breeds with thin to medium coats, this dog clipper will work well for light body grooming. You can safely and confidently work with different pet hair heights because this kit comes accompanied with four attachment combs, making it easy to select a suitable length that you would like to trim the fur to. The ergonomic design of the machine body makes it comfortable in the hands of the operator. Also interesting is that the stainless steel metal clippers can adjust to three sizes for optimal flexibility during a grooming session. 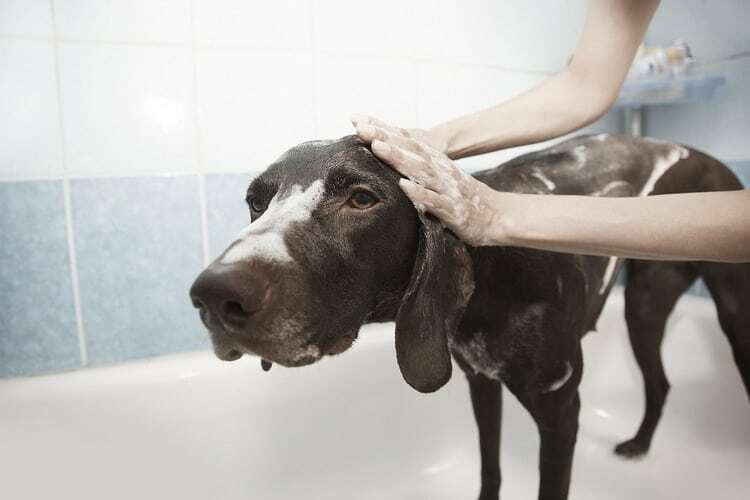 You and your pooch will love that the Andis Gentle Groom is indeed quiet even when in operation which increases the chances of a relaxed pet even as you work on her coat. At 3800 SPM, this tool is powerful and makes trimming a breeze. Also included is a six-foot cable that allows free movement as you work. If you are just starting out in learning how to give your pooch a nice trim, you will appreciate the DVD tutorial that accompanies this dog clipper as it will give you a good head start. Andis Gentle Groom Adjustable Blade Dog & Cat Clipper Kit can be purchased from authorized retailers such as chewy.com. Alfie Pet Grooming Kit is quite unique as everything in it is manual. If your mutt is among those who are overly anxious when a motorized tool comes near her body, then perhaps the Alfie Pet Grooming Dog Shears might be the way out for you and your furry pal. The kit consists of several types of scissors, including straight, curved, and thinning scissors as well as thinning blades. They all have different functions and learning what they all do is fairly easy as the kit comes with detailed instructions on what every tool does and how to use it on your pooch's coat. Also included in the kit are lubricants for the scissors. Everything included in this kit is ideal for that pet parent who values spending their quality time enjoying the personalized grooming process that does not involve any humming tool. Usually, 6-8 weeks is the recommended time within which to indulge your pooch in a grooming session using this kit. If you brush your dog's coat as frequent as everyday or every other day, then the need for frequent grooming sessions diminishes. Alfie Pet Grooming Kit is available at leading online pet stores such as Chewy.com. I’ve observed lots of pet owners become very good at grooming their own pets, all thanks to the best dog clippers available today. By selecting any of these, you can be sure to see reduced visits to a professional groomer as you realize the bonding time that you and your canine pal have been missing. Besides, the savings on money and time alone are worth every attempt. Whether your preference is a manual grooming kit, a wireless lightweight dog clipper, or one with a detachable blade, you can be sure your needs are represented by the above-listed options. Also, now is the best time to say bye to the human clippers you might have been using on your dog and to welcome the tools you should have used from the start.